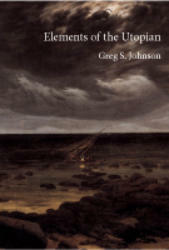 Title: Elements of the Utopian Author: Greg Johnson Imprint: The Davies Group, Publishers soft cover 208 pp. USD 20.00 ISBN 978-1934542248 March 2011 This is a unique approach to the utopian. Virtually no one would consider hermeneutical phenomenology as harboring elements of the utopian. Johnson, however, demonstrates not only how these traditions provide resources for a conceptual rethinking of the utopian, but also how such a view is practically relevant. In doing so, he engages other philosophical orientations—like current Anglo-American political philosophy—in an effort to show how his distinctive understanding relates to some of the most pressing issues in ethical and political life. The book is not, however, simply an exercise in philosophical discourse; it is a book that attempts to demonstrate the practical relevance of the utopian. In this light, Elements of the Utopian draws on concrete examples—like the South African Truth and Reconciliation Commission—to show that being “utopian” in our contemporary setting is not just thinking about the utopian differently, but a mode of existence that challenges us to learn to live philosophically. This approach, while committed to a certain philosophical orientation, engages in constructive dialogue other philosophical approaches to deepen the non- conventional understanding that appears in the book. Contents Preface Acknowledgments Chapter 1 The Specter of the Utopian Chapter 2 The Utopian Interruption Chapter 3 Forever Apart: The Bodily Element of the Utopian Chapter 4 Forever Together: Reversibility and the Politics of Utopian Possibility Chapter 5 Witnessing to the Utopian Chapter 6 The Utopian Function of Forgiveness Notes Bibliography Index Author Greg Johnson is Associate Professor and Chair of the Philosophy Department at Pacific Lutheran University in Tacoma Washington. His area of specialization is political philosophy, in particular how questions of political ethics are taken up and developed in the traditions of hermeneutics, phenomenology, existentialism and Critical Social Theory.